San Diego K1 K3 Marriage Visa Lawyer by Habib Hasbini, Attorney at Law. The Marriage visa allows for the spouse of a U.S. citizen to enter the United States as a permanent resident. To obtain permanent residency, a couple must obtain a marriage visa and then the foreign national must go through ?consular processing? and attend an interview at the local U.S. consulate. To be eligible for the marriage visa and consular processing, a foreign national must be married to a U.S. citizen and must be seeking lawful permanent residency. It does not matter how long a foreign national and a U.S. citizen has been married. A person who is married for one day is just as eligible as a couple that has been married for ten years. To obtain a marriage visa for the foreign national spouse, a U.S. citizen must first file an immigrant visa petition with the USCIS. Once the petition is filed, the U.S. citizen and foreign national must wait for the USCIS to make a determination. Once the marriage visa petition is approved by USCIS, the case is transferred to the U.S. State Department for consular processing. The State Department will request certain documents and certificates, and then (once the receive the required documents) will schedule the foreign national spouse for an interview with a U.S. official at a U.S. consulate abroad. After the interview, a visa will be issued that will allow the foreign national spouse to enter the United States and reunite with the U.S. citizen spouse. Upon entering the United States, the foreign national spouse will have permanent residency. With permanent residency, the spouse will be able to work and travel abroad. If the couple is recently married, the foreign national will only be granted conditional permanent residency, and will need to complete additional steps before the conditions on the permanent residency are removed. However, those steps will not need to be completed until approximately two years after the couple enters the United States. 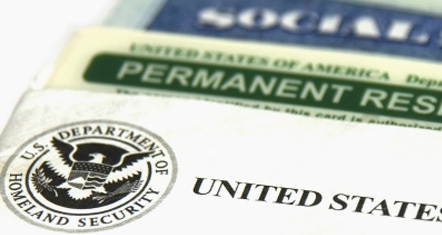 A spouse of a U.S. citizen can generally apply for U.S. citizenship three years after obtaining lawful permanent residency (either conditional or not).